I set a lot of alarms on my phone. From the first wake up call in the morning to alarms notifying me when the elementary and high school bus is supposed to come, I have a series of them set up in variety of tones. My wake up alarms are so melodious that I often snuggle in and go into deeper sleep hearing them. This was not the case with my parents. We, or rather my parents had only one moon faced alarm clock, white and chrome, which stood on two tiny legs and had two buttons around the top. It was wound by a key like all clocks were on those days and I am sure the alarm was set in a similar fashion. Standing on its two legs, it looked exactly like how you would draw an alarm clock. It also had a jarring, steely noise, that would not only wake us up but also the neighbors and any stray dogs or cats in the street outside. However, unlike me, my parents rarely needed an alarm. My mother's body clock would be naturally set to a fixed time in the morning when she would wake up. In turn she would go around acting as our very own human alarm. We didn't need a clock. There were only 2 or maybe 3 days a year that our Alarm clock with the jarring alarm would be put to use. Two of those days would be when we had to catch the early morning train to go to my grand parent's home. And the third day would be on Mahalaya! This day marked the end of PitraPaksha and start of Debi Paksha, the fortnight when Ma Durga would arrive. I did not pay any attention to these details though. For me, Mahalaya was synonymous with the radio program Mahishashurmardini, aired by All India Radio at an ungodly hour on this day. We never did say "Mahi-sha-shur-mar-dini". "Mahalaya shunte hobe", was the phrase. We have to listen to Mahalaya. It was not a day, it was a phenomenon. To wake us all up in time for that program, the alarm would be set to an ungodly hour of 3 in the morning. To be sure that the hour is not missed, my diligent Baba always set a couple of practice alarms the evening before.Reassured by that earth shattering krrr-rr-ing a couple of times he would finally set it to 3AM the next morning. He then checked the new set of radio batteries repeatedly and set the dial to Akaashbaani. My Mother kept her clothes ready to change into the next morning. It was no ordinary radio program after all. "Kal bhor bela uthe Mahalaya shunte hobe. Ghyaan ghyaan na kore uthei chaan kore nebe", I would be coaxed repeatedly the night before, to wake up and take a shower the very first thing in the morning. Honestly as much as I was excited for DurgaPujo, I dreaded the early morning Mahalaya. I was never a morning person and waking up at 3AM was not my forte. My parents were ardent fans of the event though and would be up before day break . Tightly holding a pillow over my ears I mostly slept through the jarring alarm and the sound of morning ablutions. My Mother tried various methods like untying the mosquito net and letting the soft net fall in a heap over my sleeping self. I did not budge. Finally she would patter away grumbling about my insouciance. As the first pink ray of sunlight hit the earth, the radio would crackle and there was this resounding voice reverberating over ether and entering our home through the radio. The deep baritone of Birendra Krishna Bhadra, traveling from afar and bouncing off the walls of our house. There was some magic in that chant that pushed even someone like me out of the bed, and rubbing my eyes I would sit around the dining table listening to him invoking the Goddess. 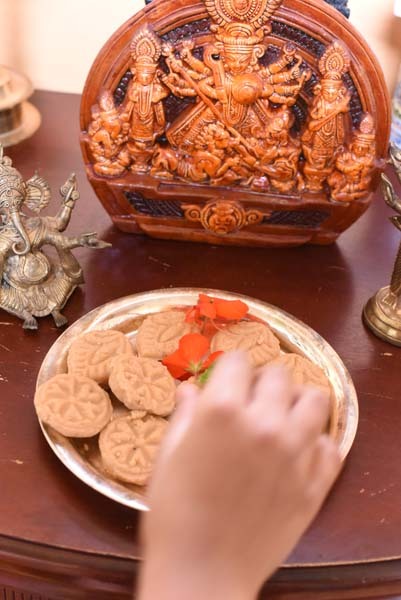 Crisp Thin Arrowroot biscuits dipped in cups of sugary tea, mingled with 'Bajlo alor benu..." on Mahalaya mornings. Strains of the same voice would float around from neighboring houses too and the neighborhood would be all awake in their separate homes, united by the power of the single voice reciting "Ashwin er sharod o praate..". 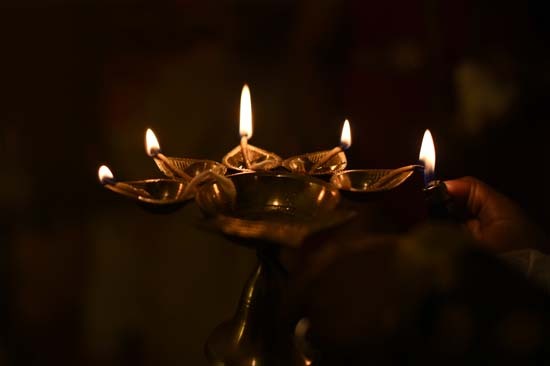 I never managed to listen to the entire Mahalaya program ever and dozed off some where between the chant and the songs, carrying the voice deep in my heart. A voice that I would never forget even when radios were replaced by television and later youtube channels. On Mahalaya I still listen to the original version of mahishahshur mardini. In my early days in the US, it was cassette tapes but now Birendra Krishan Bhadra lives on over the ether once again via on-demand internet. Tomorrow early morning it will be me and Mahalaya once again. With Birendra Krishna Bhadra, Thin Arrow root biscuits and cups of sugary cha. My girls will sleep on. What a lovely read - it captured the mood of the morning :) We had a similar early morning wake-up and oil bath on Diwali day. A nostalgic read...brought back memories of my childhood. I am a half Hindu half Bemmo but my mum made me go through this as well and I did exactly what you said this morning albeit with Darjeeling tea and minus the biscuits. Shubho Mahalaya. Reading this brought back memories of our days in Calcutta. [am settled in Bangalore now]. At an unearthly hour on Mahalaya morning, to wake up to the uniquely sonorous voice of Birendra Krishna Bhadra from our radio and those of all our neighbours was always a thrilling experience. 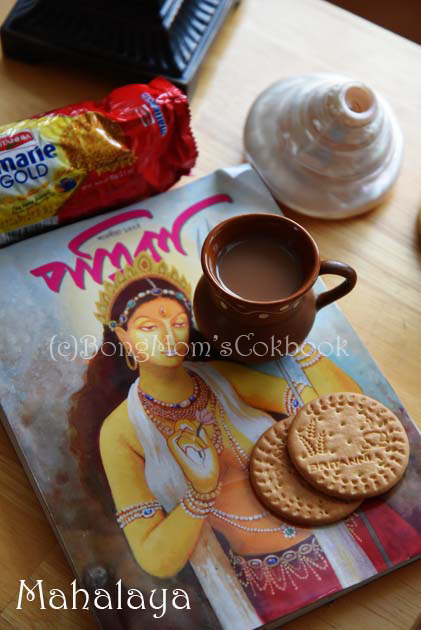 If you ask the neighbourhood grocery shop for Britannia , it was always the Thin Arrowroot biscuit--- it was so much part of Bengali daily life !! Thanks for this..beautifully written..can identify with each word..
Hi! You have mirrored every sentiment of mine as if I were writing it. I am now in Delhi and caring on the tradition. Like you. I just wanted to say I remember pronouncing it thin arrAroot biskoot to this day. I had my nephew bring me some from Calcutta as I couldn't find them easily here. They are not as crunchy as they used to be. I guess the reality is always removed from the memory. I enjoy your posts. Thank you.